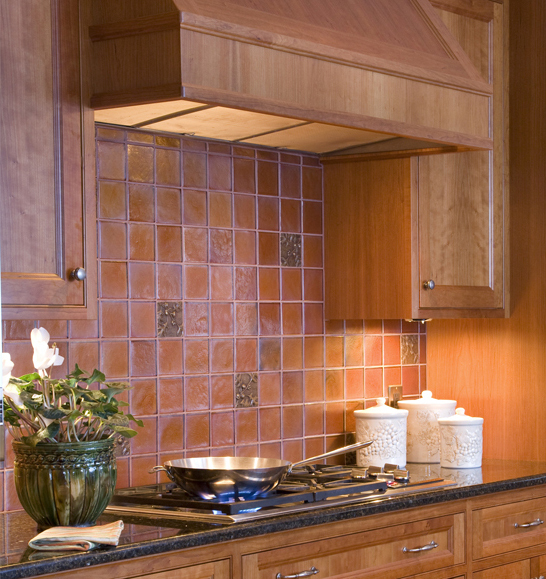 A kitchen backsplash can be an important design element, often providing a focal point that helps define the room. Regardless of the style of your home, you’ll find an endless variety of materials available in every possible color, shape and size. Natural stone, glass, ceramic tile or stainless steel; how do you choose? 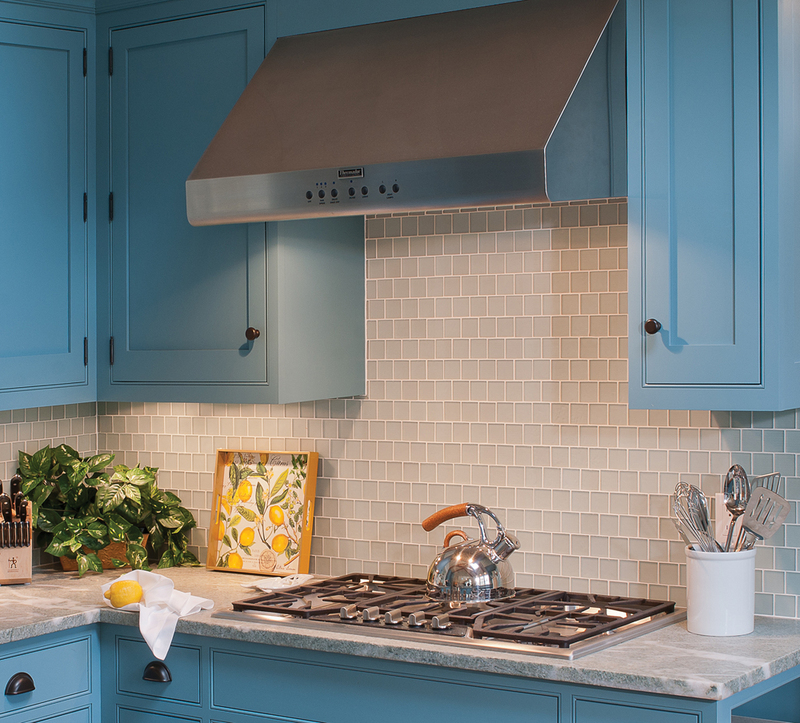 At Elizabeth Swartz Interiors, we consider several factors when advising our clients on choosing a kitchen backsplash: design, (including the overall look and how the backsplash integrates with other design elements), function and budget. Traditional or contemporary, bold or subtle, you want your backsplash to be consistent with the overall look and style of your kitchen. Be sure to consider other surfaces in the room, such as the countertop, the floor, the walls and the appliance finishes when narrowing down your options. 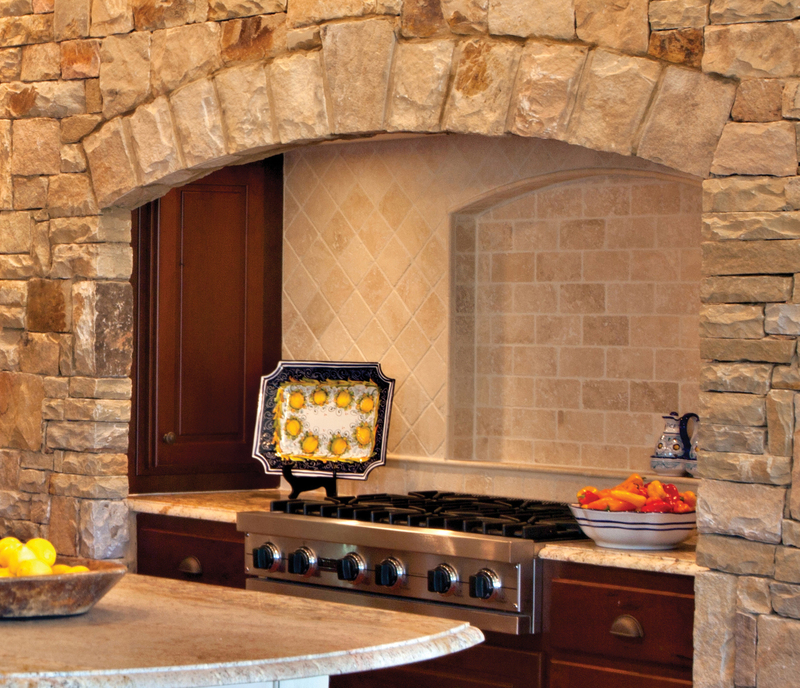 (Above) The backsplash in this rustic stone alcove incorporates several different patterns and sizes of honed stone tiles behind the cook top, consistent with the old-world feel of the kitchen. The inner tile arch is an intentional mirror of the outer stone arch, both reminiscent of a hearth. (Above) The painted farmhouse bead board backsplash along with the dark marble countertop and traditional, decorative faucets blend with the custom cabinetry to create this French country kitchen. (Above) The vertical installation of this large-scale, richly veined, zebra-striped natural marble tile contrasts nicely with the leather finished black granite countertop, and is the perfect backsplash to showcase the floating glass shelves in this contemporary home. Designing a backsplash that is aesthetically pleasing often involves bringing together a variety of colors, textures, sizes and shapes. (Above) In this small South Boston kitchen, you’ll find honed stone tiles set on the diagonal with polished Pistachio marble accents both interspersed and as a small mosaic horizontal border that runs the length of the countertop. (Above) This backsplash in the family room bar of a vacation home combines multicolored slate cut in varying sized horizontal strips. 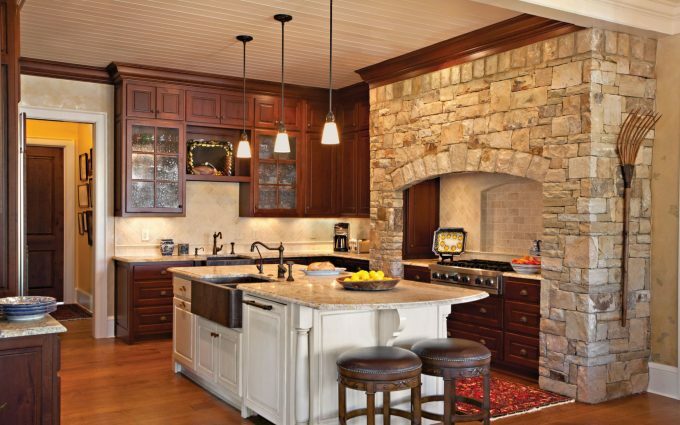 Positioned against the smooth granite countertop, the rustic stone backsplash adds texture and visual interest to this otherwise traditional space. 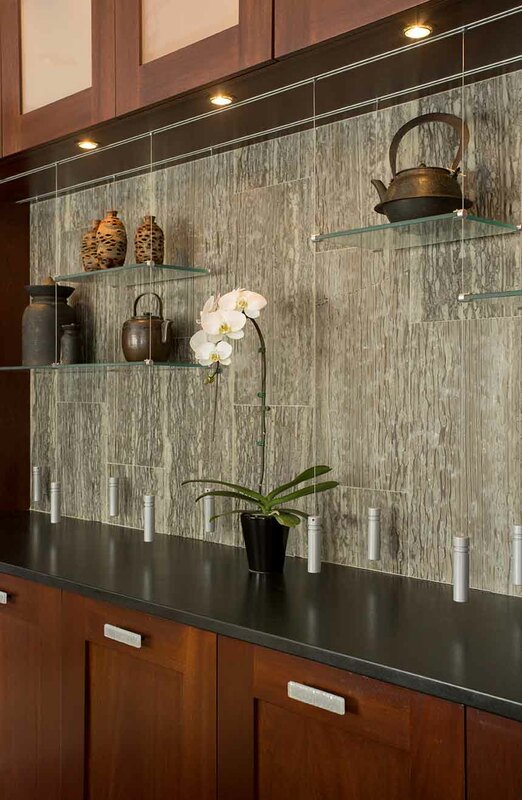 Using several materials for the backsplash can add visual appeal to a single color or smooth texture. (Above) In this kitchen, the textured glass tile has an iridescent glow that adds warmth while the cast bronze tiles add texture and are a subtle complement to the outdoor motif of the room. 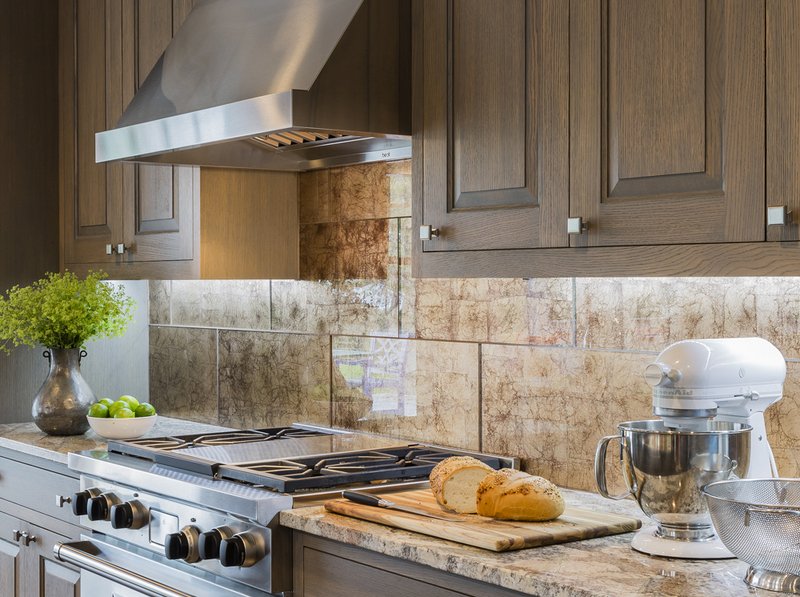 When it comes to backsplashes, function is every bit as important as style. Choose materials that are heat and stain resistant, and require little to maintain. (Above) We chose stainless steel in this kitchen, a solution that cleans easily and holds up to the heat thrown off by the oversized cooktop. It is the perfect complement to the wood cabinetry and both the honed marble and butcher block countertops, creating a look that is clean and simple. Ceramic, porcelain and glass tiles are a practical choice because of their stain resistance. Clean up is as simple as a quick wipe with a sponge or cloth. (Above) This kitchen backsplash was designed using a large polished glass tile with antiqued copper leaf applied to the reverse side. The result is a beautiful look with warm hues throughout the tile, counter and custom cabinets, yet it is practical for every day use. 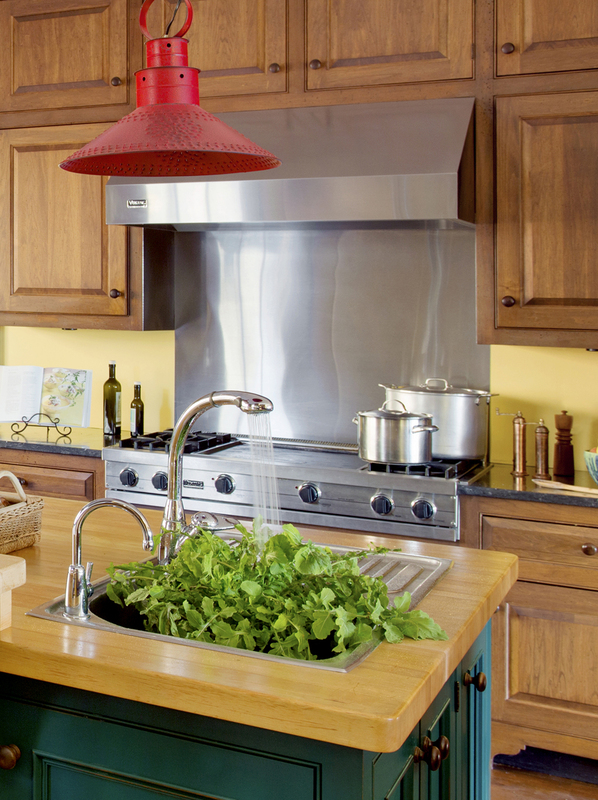 The cost of a backsplash varies greatly depending of the size of the kitchen and the materials chosen. 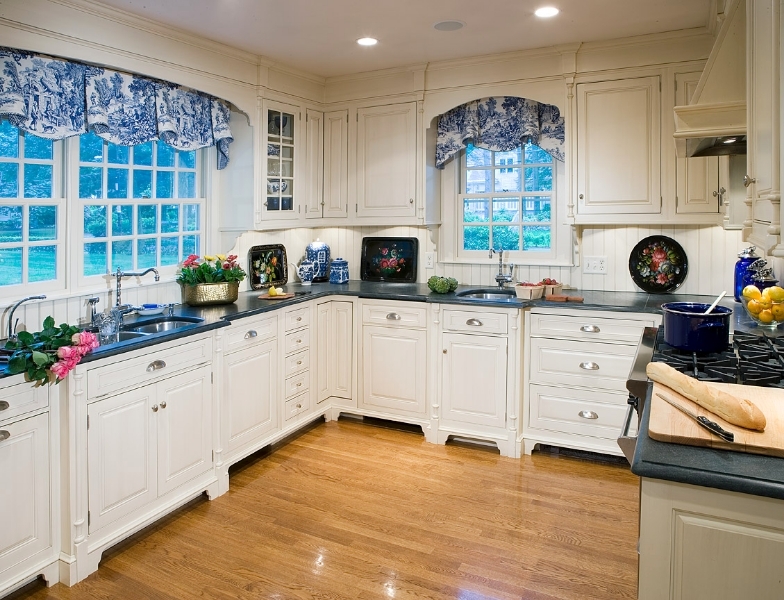 In the overall budget of a kitchen remodel, however, it is a relatively small expensive. 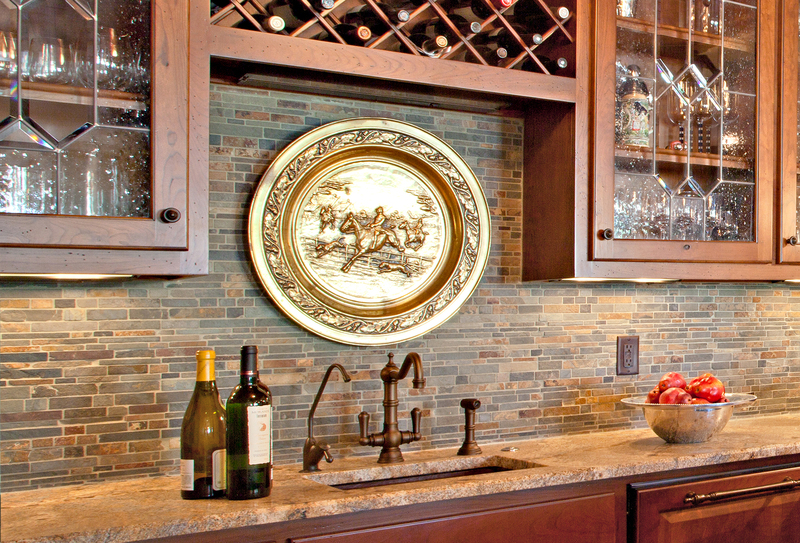 Yet, because a backsplash is a significant design element, it is the perfect place to splurge. Glass tile comes in an ever-increasing number of colors, shapes, sizes and combinations. (Above) In this ocean-side kitchen, we specifically chose a pale frosted blue glass tile to coordinate with the custom cabinets. 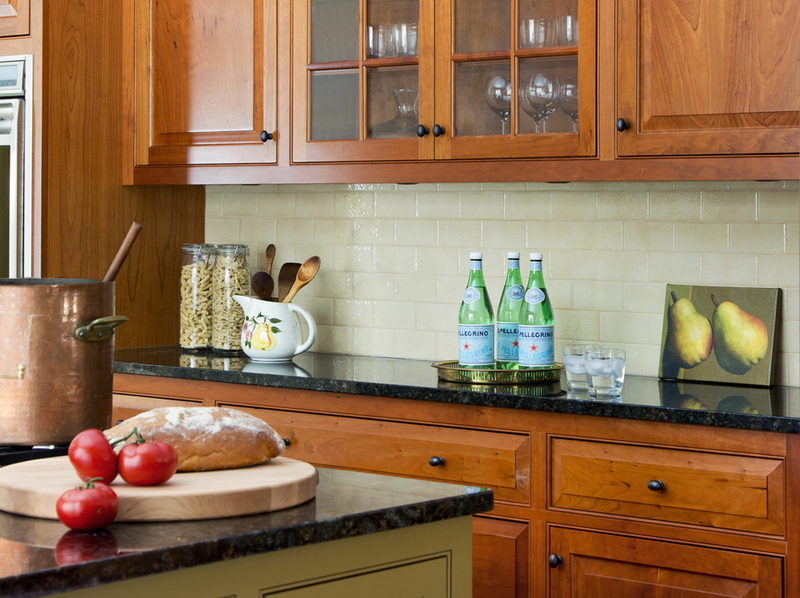 Subway tile is an American classic and can be found in a variety of colors. (Above) Instead of a traditional white, we chose subway tile with a unique texture and a soft off-white glaze for this Colonial-style home. The kitchen backsplash is an opportunity to let your personal style shine through in what is one of the most important rooms in your home. 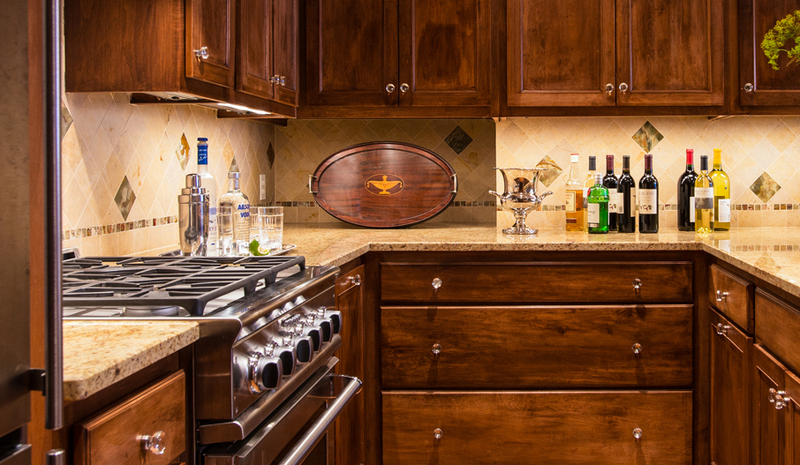 At Elizabeth Swartz Interiors, we help guide you through the process of design, space planning and material selection so that your kitchen, and every room in your home, reflects your personal style. For more information about creating a distinctive and inviting kitchen, please be in touch. Great assortment, great work Elizabeth! Hello. Just beautiful. 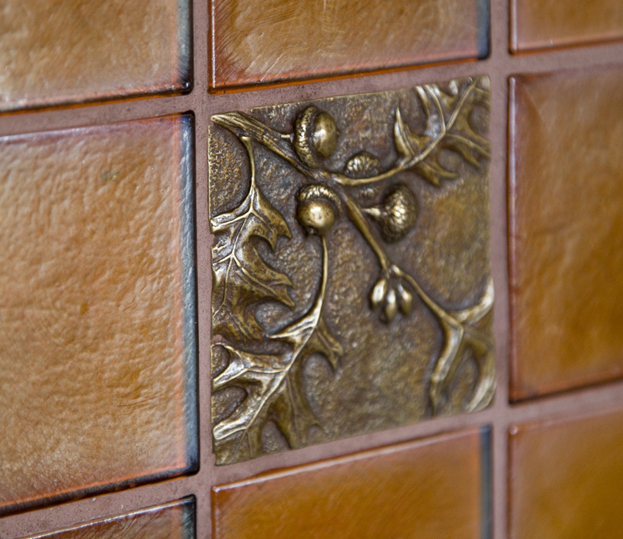 The bronze acorn tile is what I have been searching for for a long time. Can you share the information on it so I may purchase it? Thanks…. I would also like to know more about the bronze acorn tile! Could you post the information to find it? Hi Sara- Can you please email us at eswartz@elizabethswartzinteriors.com? Thanks!